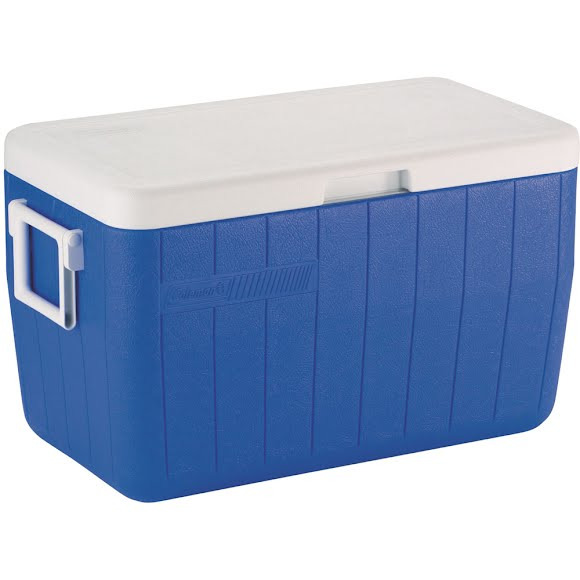 Keep your food and drinks cold, and keep the fun going, for up to 3 days when you bring a Coleman 48 Quart Performance Cooler. Large enough to hold 63 cans and tall enough to hold 2-liter bottles upright, you'll have plenty of space for refreshments for a whole group of people. Keep your food and drinks cold, and keep the fun going, for up to 3 days when you bring a Coleman 48 Quart Performance Cooler. Large enough to hold 63 cans and tall enough to hold 2-liter bottles upright, you&apos;ll have plenty of space for refreshments for a whole group of people. Whether you&apos;re headed on an overnight camping trip, to a tailgate party, or out to a BBQ, the 2-way handles make getting to your destination easy. When the fun is done, the leak-resistant drain makes it easy to empty any excess water, so you&apos;re ready for your next fun adventure.